Appia Antica (prime area) is a ritzy residential area of luxurious villas, flanking the older section of the great Appian Way. This famous ancient road connected Rome with Brindisi, a major seaport city. Once the most important road in the region, the Via Appia fell into abandonment sometime around the 5th century. In the 18th century, Pope Pius VI called for the road's restoration, and also had a new Appian Way built the Via Appia Nuova. The older road close to Rome therefore became known as the Via Appia Antica. There are classical ruins and ancient catacombs, reminders of Rome's glorious past. 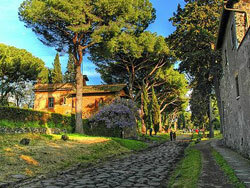 Appia Antica is an expensive neighborhood as well as a beautiful one. Most of the housing in this area is fairly new. Many privately-owned luxury villas are found in this area. Some are even owned by celebrities. The more isolated villas may experience problems with security. There are many public parks in this area, and some good restaurants, but few shops. Public transportation is not too bad. In any case, Appia Antica is not very far from Centro Storico.